Did you know the Evangelical Lutheran Church of America turns 25 in 2013? 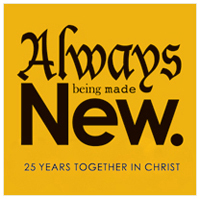 "Always being made new," was chosen as the theme for this year's anniversary, because as Presiding Bishop Hanson stated, "It is through God's grace that we are made new day by day to proclaim Jesus Christ and boldly participate in God’s work. As Luther said, this faith is a living, busy, active, mighty thing." The ELCA's website describes the choice of "being made new," as the best reflection of what the church has always stood for. "We are a church that is deeply rooted – and always being made new. Our roots are in Scripture, tradition and the Lutheran Confessions, as well as in the vibrant communities and rich histories of our congregations. These roots are an ongoing source of nourishment, enabling us to be a church that is resilient, always reforming and guided by the Holy Spirit." Did you know Grace is older than the ELCA? Grace Lutheran Church, as we currently know it, was built in 1949, but the church was formed long before that in 1922!Click here to read more about the history of Grace. Click here to find out more on the ELCA's 25th Anniversary.